What isn’t obvious at first glance about Dubois. The man who had ordered the lattes was tall, patrician, lantern-jawed. He wore a fitted, aqua-blue down jacket. His female companion wore her hair cut blunt to the chin. I didn’t believe we had met. “Where you from?” I asked (always eager to welcome visitors or newcomers). “Jackson,” he replied. He seemed un-motivated to continue the conversation. I explained the reason for my approach: We’re surveying tourists about how they plan their vacations. “I guess you didn’t have to do very much planning to drive over the Pass,” I said. “Quite a bit different in Jackson,” I ventured. It wasn’t the first time I’ve heard this kind of comment from someone in Jackson. The slight double-take when you say that you’ve come over from Dubois, that dull little back-country cowboy town. His remark brought to mind the memory of breakfasts on road trips, at a diner in some small farm town. The old men in suspenders and baseball caps trading barbs with the waitress. The sense of inexorable boredom. This made me wonder exactly what he meant by the “cultural interest” he enjoys over there in Jackson. Maybe he meant the Asian tourists who crowd the Thai restaurants in off-season. To judge from the folks I see in the supermarket over there, it’s not exactly a melting pot. I also wondered whether the owner of the coffee shop in Dubois had overheard the man’s remark as she was preparing his latte, and if so, what she was thinking about it. Being shy and soft-spoken, she wouldn’t join the banter. As it happens, she comes here from the Philippines by way of Abu Dhabi. Before the couple walked in, I had been telling my neighbor, a biology professor who runs the wildlife education program here. about someone she hasn’t yet encountered in town. A retired nuclear physicist, he always goes to Nepal for fun and has hiked Mount Everest several times. One of my best friends in Dubois grew up in Pakistan and Singapore. A woman who lives up-mountain used to work for the Fed. The yoga instructor used to head a wilderness program for kids with learning disabilities. The man who takes the terrific nature photographs actually designs medical equipment by profession. Another man who worked for a long time here as a wrangler actually comes from Sweden. “Tell me about yourself” usually starts a conversation well worth the time. Dubois is in the middle of wilderness, true. 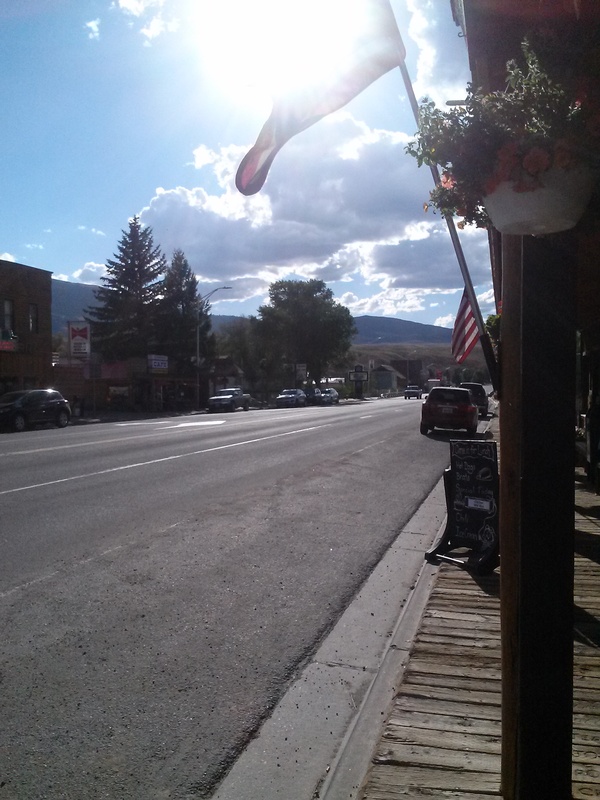 Our most famous cafe is named Cowboy, and we keep our main street looking like something out of an old Western. But there’s far more to it than you can see at first glance. One of the joys of being here is what we see as it reveals itself, but only slowly. A great one! You should be careful. You will singlehandedly quadruple the population. Love your blog.